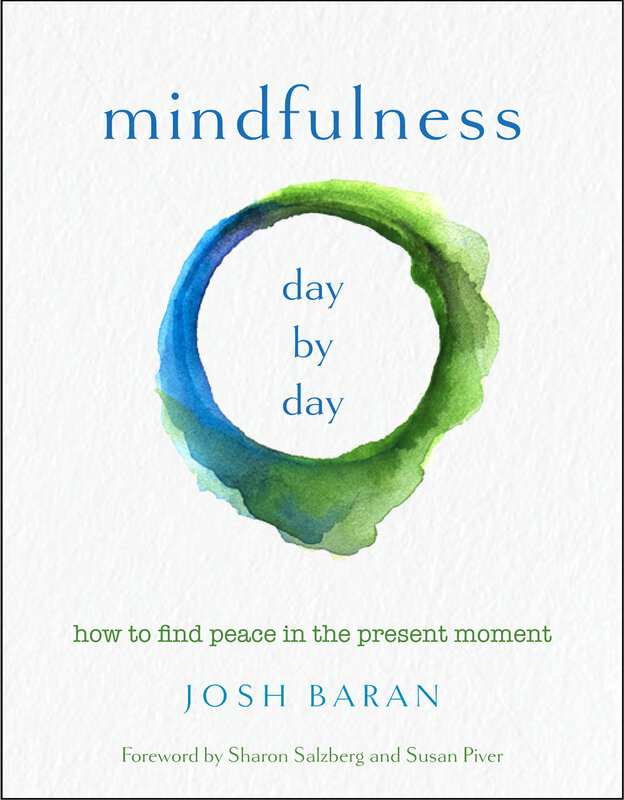 Josh Baran’s book, Mindfulness Day by Day: How to Find Peace in the Present Moment, is an anthology of short teachings, insights, stories, poems from both western and eastern sources, ancient to modern, secular and religious. All the carefully gathered pieces celebrate present moment awareness and finding happiness here and now. This book is a perfect sourcebook for the growing mindfulness movement. First published in 2003 as 365 Nirvana Now, this 15th anniversary edition (May 2018) includes an updated title and a new introduction from meditation teachers Sharon Salzberg and Susan Piver. Mindfulness Day by Day is a valuable resource for anyone who meditates or has a mindfulness practice, as well as meditation and yoga teachers. Just open the book anywhere and read a few pages. People often imagine inner peace as something only for the spiritually elite, requiring decades or even lifetimes of spiritual practice in Himalayan caves. Mindfulness Day by Day: How to Find Peace in the Present Moment suggests that the awakened state is actually immediately present and available to everyone. Josh Baran, a former Zen priest, spent ten years gathering hundreds of the most powerful and inspiring examples of this insight—illuminating the abundance and grace that is here right before our eyes and in every breath. Josh's book has been praised as an “exquisite handbook for enlightenment,” as “an invaluable resource for anyone interested in finding peace in the present moment,” and called, “the ultimate hit parade of ageless wisdom and timeless presence.” The book has been endorsed by Oprah Winfrey, Lama Surya Das, Byron Katie, Rodney Yee, Raphael Cushnir, Krishna Das, Susan Piver, Sharon Salzberg, Helen Palmer, and featured in such publications as Time Magazine, O the Oprah Magazine, Tricycle: the Buddhist Review, and Shambhala Sun. In this treasury of timeless wisdom, Josh has carefully gathered voices - secular and spiritual - spanning cultures, centuries, continents and traditions—from ancient Buddhist, Tibetan, Indian, and Zen sages to Christian and Jewish mystics to contemporary western teachers, artists, scientists, screenwriters, and poets—all celebrating the beautiful perfection of the present moment through stories, dialogues, songs, meditations, teachings and poetry. Whether these insights spring from the Buddha, St. Francis, or Alanis Morissette; from Krishnamurti, Eckhart Tolle, or the Dalai Lama; from ancient texts or modern films —they all point to the same essential truth. The flow and juxtaposition of the selections is often startling and profound, each standing alone yet simultaneously building on one another. Additionally, Josh acts as our private guide, providing personal insights through his on-going commentaries. He answers many questions readers may have when encountering this simple viewpoint. Mindfulness Day by Day is an invaluable companion for anyone, regardless of spiritual experience, seeking peace in their life. Open this book at any point and read a handful of passages. You will see how this collection is a daily call to presence and a reminder that the only reality we ever truly experience is here and now. This book is especially useful to teachers of mindfulness and yoga, personal coaches, etc. "Do you really want to be happy? Just pay attention and be kind, unconditionally kind, on this breath alone. Forget about the future. Just this breath. No matter what the circumstances, just be kind. Friend, lover, family member, someone who seems to hate you, someone you’ve never met on the street, your own soft animal body. Just be kind, in whatever way is appropriate. Everything else will work itself out, and you will begin to sense your own Pure Heart everywhere. How amazing. Very simple. Just be kind. Only on this breath."